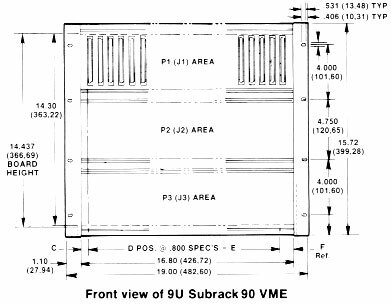 Subrack 90 VME » Unitrack Industries, Inc.
As one of the nation’s pioneer manufacturers of p.c. 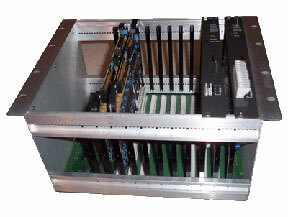 card cages, known for their versatility and low cost, Unitrack offers the Subrack 90 VME. It is a basic subrack compatible with Eurocard based bus systems and is ideal for those developing VME systems. The basic Subrack 90 VME shown on these two pages is for single or double-high boards. 3U to 9U heights and up to 84 HP width. 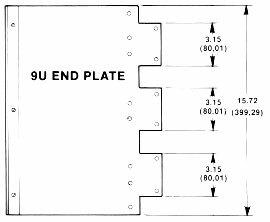 There are countless variations possible for VME bus systems such as divided subracks for mixing 3U and 6U Eurocards in the same 6U subrack; hinged or fixed front panels; top, bottom and back panels; insulator strip card guides, etc. The Subrack 90 VME has an attractive brushed aluminum finish, clear irridited. The sturdy extrusions, end plates and other parts are accurately punched, drilled and tapped. (Also available unassembled.) 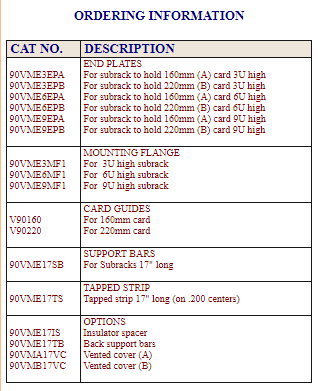 The Subrack 90 VME is designed for Unitrack’s card guides. 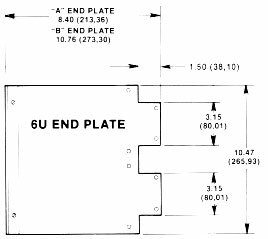 These guides are available in either non-conductive or conductive ESD (electrostatic discharge) plastic. An 84 HP wide Subrack 90 VME is available with a divider so that single high and double high board VME systems can be housed in one subrack. The divider can be placed center, to the right or left. Another common variation is a Subrack 90 VME to house both single high and double high boards and also provide a built in cable channel. 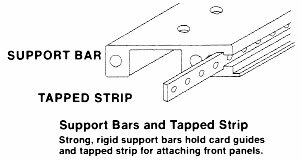 42 HP subracks are often used for single high or double high boards. For those designing VME packaging systems, we offer the various parts of the Subrack 90 VME as parts which can be purchased individually. In this way you can build your own subrack to house boards of different sizes. Our engineering department will work with you to assist in packaging your system using our well engineered, quality parts. Just call or FAX your requirements to us. Front panels are available for 3U and 6U heights and various HP widths (4 and 8 HP standard) to customer requirements of size, cutouts or silk screening of legends, etc. Consult factory. Card Guides are available in two sizes. Molded of dimensionally stable polycarbonate with integral snap-in buttons.